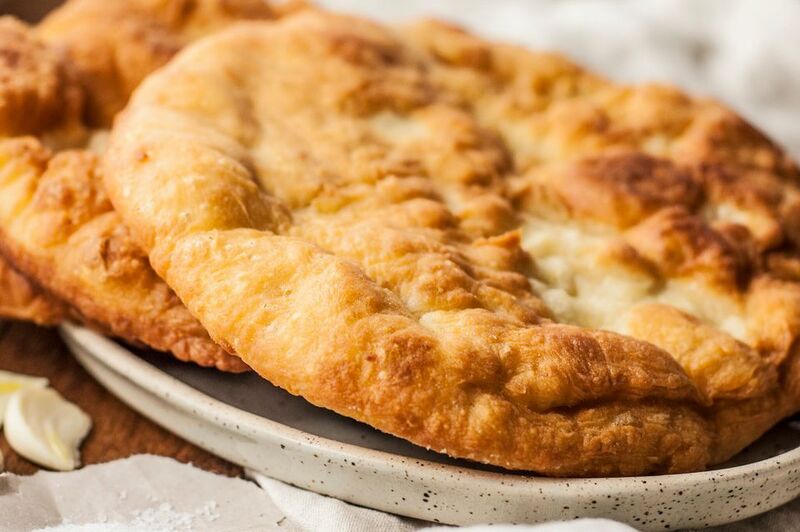 Langos is Hungarian fried bread, sometimes called Hungarian pizza. It is a favorite street and fair food that has a yeast dough made with mashed potatoes and flour. This snack became part of the country's cuisine centuries ago when it was introduced by the Turks during their occupation. Today it's a popular appetizer or snack usually simply rubbed with garlic and sprinkled with salt. Some incorporate caraway seeds into the dough. Place freshly mashed warm potatoes, yeast, sugar, flour, oil, salt, and milk into a medium mixing bowl or stand mixer. Using the paddle attachment, combine the ingredients until they are well moistened. Switch to the dough hook and knead for 5 to 7 minutes or until smooth and elastic. Transfer to a greased bowl, cover and let rise until doubled. Divide dough into 4 equal portions. Shape each piece into a smooth ball and place on a lightly floured board. Cover and let rest 20 minutes. In a large skillet, heat 1-inch canola oil to 350 F.
Flatten and stretch each dough ball to about an 8-inch diameter. Make 1 or more slits in the center of the stretched dough. This is traditional and also helps to keep the dough from puffing up in the middle and not frying properly. Fry one langos at a time about 2 minutes per side or until golden. Drain on paper towels. Serve hot rubbed with a cut garlic clove and sprinkled with salt. After rubbing with garlic and sprinkling with salt, a savory variation would include topping with sour cream and chopped dill or shredded Emmenthaler or Gruyère cheese. For a sweet version, eliminate the garlic and salt and sprinkle with cinnamon sugar or confectioners' sugar much like the elephant ears found at festivals and fairs in the States. Among the many Hungarian hangover remedies is the practice of eating langos generously rubbed with a cut clove of garlic, and night owl soup or korhelyleves. This soup is a hearty combination of sauerkraut and smoked meats.